Many Bible scholars believe the period-by-period way to be the better and the most effective way for it enables the teacher to present the content of the Bible more logically and systematically and it enables the leaner to better understand and remember the matter taught. 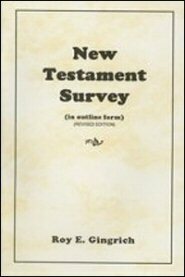 The author of this book has wisely chosen the period-by-period method of teaching New Testament Survey. This survey is presented in outline form and it divides the New Testament era into 6 periods concerning the Church, for the New Testament deals with the church in contrast to the Old Testament; which deals with Israel. The preparation for the church, the founder of the church and the growth of the church are dealt with logically and chronologically.